Sadly, this post is in dedication to my paternal grandfather, who passed away this morning after a long hard battle with Parkinson's Disease. Grandpa John was the last of my grandfathers with us. As I mentioned, he had battled Parkinson's Disease for years, so my family and I are finding solace now in the fact that he has been released from the unreliable body that the disease had slowly claimed. Parkinson's is truly is an awful disease that most recently - between the actual decline of motor function and medications - had robbed him of his ability to speak. But not to think. His sense of humor, commentary and quick wit was still present and obvious in his eyes, though he couldn't always get his point out verbally in more than a whisper. I will unwaveringly remember my grandfather as the man that I knew him as when he was still able to communicate those thoughts. He was a sharp man, quick to tease and bestow funny comments on everyone and anyone whom he happened to meet. He always gave the best (read: annoying to parents) presents that made tons of noise and were nothing but fun. I will always incorporate the memories of others into my mental image of him as well. Growing up, I heard stories of the young man I never knew - the young man who flirted and sang, was athletic and handsome as he graced ice skating and roller skating rinks. 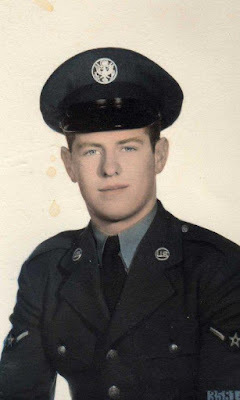 It was easy to imagine when I looked at the photo of a young John Leo Brawford in his Air Force uniform that hung in our hallway when I was growing up. We had some warning that his health was declining lately, so I have been making my peace with his passing for a while now. In reflection about the inevitability of his passing, I thought for a long time about how different the experiences of extended family are across generations. I was privileged enough to meet, know and develop relationships with three grandfathers and one of my great grandfathers. My first grandfather to pass didn't leave us until I was a junior in high school. My great-grandfather passed away just a few years ago when I was in graduate school. While I know that my daughter's grandfathers will be around for a long, long time - you hear me grandfathers? - it does make me sad that she will never know her great grandfathers. I always felt so privileged and amazed to hear stories from my own great grandfather. And it was just that, a privilege. 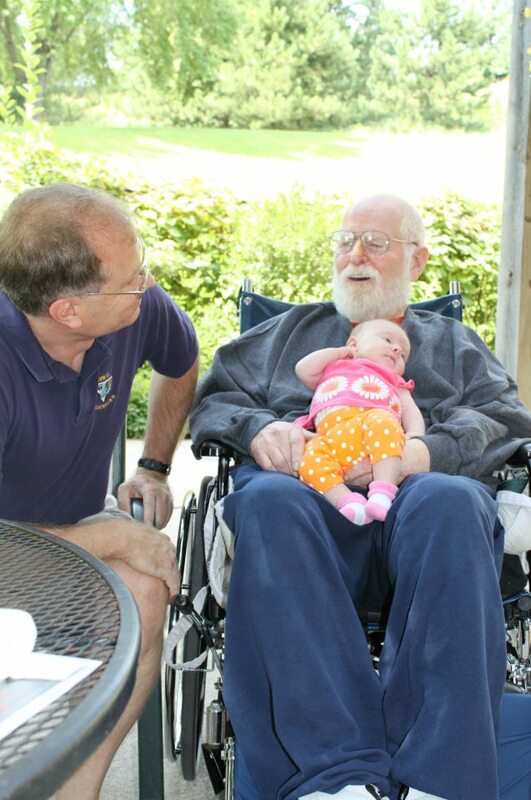 Evelyn did get to meet Grandpa John this summer when we visited Wisconsin. I wish that she would have gotten to spend more time with him, though if it were a perfect world, she also would have been able to develop a relationship with him with no disease to get in the way. Just as I incorporate memories from others into the man that he will always be in my mind, I hope to give my daughter that same portrait of the man who held her and smiled so proudly when she was just a month old. ...and I know that he is in a better place, but to keep others from this same awful disease, we have to find effective treatment, or better yet, a cure. If you would like to learn more about Parkinson's research here and here are some good places to visit on the web. I'm so sorry my dear. I'll definitely be praying for you and your family during this difficult time.